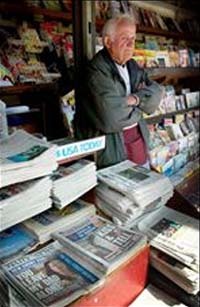 Joe Carney sells newspapers in Harvard Square in Cambridge, Mass. Many newspapers face declining readership and shrinking revenues. Will the last American newspaper lose its last reader before the middle of the century? Journalism professor Philip Meyer thinks it's possible. After all, the percentage of adults who report reading daily newspapers has fallen from 81 percent in 1964 to just 52 percent in 2004. If the trend continues, there won't be any readers left within a few decades, says Mr. Meyer, an author and former reporter who teaches at the University of North Carolina. The unhappy prospect of fizzle instead of fizz isn't the only challenge facing publishers and editors. The antics of plagiarizing and lying newspaper reporters have scarred the media's credibility. Recent industry scandals raise questions about whether newspapers are fudging their circulation numbers, and federal do-not-call legislation stopped the lucrative practice of selling subscriptions through telemarketing. And now, free websites like craigslist.com are siphoning off millions of dollars in vital classified ad revenue from newspapers. Of course, Meyer is hardly the first person to forecast the demise of newspapers. Critics have been highlighting the industry's struggles for decades, as afternoon papers folded and dozens of cities became one-paper towns. Still, more than 1,400 daily newspapers continue to set the news agenda for television, radio, and the Internet, both nationally and locally. Meanwhile, newspaper advertising revenue grew during all but the first three years of the 1990s, and it went up during the last quarter of 2004, too. "Don't believe the doomsayers," says Jay Smith, president of the Cox Newspapers chain. "They've been out there for a long time, and we'll gladly carry their obituaries." But there's no denying a sense of looming crisis as subscription numbers at individual newspapers drop - 2 percent here, 5 percent there - each year. Even the industry's traditionally healthy profit margins won't survive if advertisers balk at paying top dollar to reach elderly diehards - senior citizens still love papers - or no one at all. What to do? "The newspapers will have to be smart about distributing the news in the way [young] consumers want, or they won't be relevant," says Sammy Papert III of Belden Associates, a newspaper research firm. Indeed, newspapers are trying to reach younger people through quick-read free papers, Spanish-language papers, and stand-alone weekly entertainment tabloids. But most of the new strategies rely on an old standby: ink printed on a page. And that may spell trouble. According to the Washington City Paper, an alternative weekly, a recent internal Washington Post study found that many young people would refuse free subscriptions because they don't want bulky newspapers cluttering up their homes. Younger people are used to news content on the Internet, which allows them to pick from lists of headlines instead of flipping through pages to find stories that interest them, says Adam Penenberg, assistant professor in the business and economic reporting program at New York University. "They customize their news-gathering experience in a way a single paper publication could never do," Mr. Penenberg wrote in a Wired News column last year. "And their hands never get dirty from newsprint." For now, however, the websites of most newspapers are little more than mirrors of the printed product, and few allow users to filter out news they don't care about. Some newspapers are experimenting with live online chats, virtual diaries known as blogs, and the delivery of news to handheld devices. But all those bells and whistles require money, and while the mass newspaper layoffs of the last recession are over, publishers are hardly prepared to go on spending binges. By refusing to invest in their products, however, publishers are guaranteeing their eventual demise, says Meyer, author of a 2004 book called "The Vanishing Newspaper: Saving Journalism in the Information Age." Meyer points to a business theory that says "when a new technology comes along to replace you, and you can't think of any other way to fight it, the only way is to increase prices, reduce quality, and take as much money out of the company as you can." That's happening now, Meyer says. "Newspapers won't admit it, and they might not be aware of it. But that's what they're doing. It's an irrational strategy, but the end won't come during the career lifetimes of those managing the process." What if Meyer is right and newspapers disappear? Mr. Penenberg, who famously exposed the faked stories of a New Republic reporter in the late 1990s, isn't worried. While people in the media like to caricature the young as vapid, they actually read "voraciously" and appreciate strong news coverage, he says. "I don't think it matters whether newspapers survive," he says. The industry "is tied to this idea that news has to be on a piece of paper they hold in their hands. What's wrong with reading the same story on a screen?"